So you're strapping your surfboard to your roof rack and you notice a ding, probably from your last surf session. Or maybe you have just gotten off the plane at your dream surf destination and realized that the baggage handlers were less than careful with your surfboard and there is a huge ding in your board. How to fix dings can save your vacation or next surf session. Ding Repair Kit - containing resin, hardener, popsicle sticks, fiberglass cloth, and Q-Cell filler. 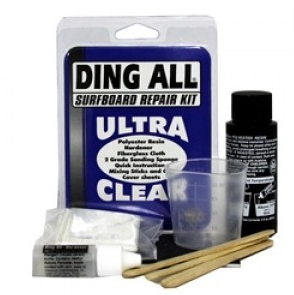 There are different kinds of ding repair kits, including for epoxy and ultra fast cure. Cut away the damaged area with a knife / razor blade. If your ding is just a crack, you don't need to cut away the damaged area. Clean and sand the damaged area. Use your knife and acetone to do this. The knife can be used to pull any wax you might have used as a filler and the acetone will remove any other debris. Tape off the workspace. I prefer painter’s tape over masking tape because its lower adhesion does not leave any adhesive gum behind like masking tape can. If your ding is deep you will need to mix up the Q-Cell. If you bought a ding repair kit, follow the instructions provided. If you are using separate resin, catalyst, and Q-Cell; mix one ounce of resin (about two tablespoons) with the Q-Cell till a thick paste forms, then add about 10 drops of catalyst. Pour the Q-Cell into the ding. Do this slowly pushing the Q-Cell into the ding so as not to trap any air into the hole. If air gets in between the surfboard foam and the Q-Cell, it will create a weak spot. Once the Q-Cell hardens, sand smooth. Try to sand the ding spot a little lower since you will be adding resin and fiberglass to the top of the hole. Cut an overlapping piece of fiberglass to the shape of ding. The overlap should be about a half inch. Mix your resin and catalyst. Place a small amount of the resin mixture onto the ding with a popsicle stick. This will hold the fiberglass in place. Make sure to firmly apply the fiberglass to the damaged area. Depending on how bad the ding you may want to add a second piece of fiberglass to the ding. Put more resin on top of the fiberglass. Make sure to spread the resin out evenly. Apply another coat of resin. After this coat of resin has hardened wet sand the area. Place some water on the area and sand in a circular motion. Let the patch cure for about a day. You are now ready to surf! And if you are on vacation you have only lost a day instead of an entire trip. A quick warning, your first repair will be messy! But don’t stress too much because each time it gets easier and cleaner - you have to start somewhere.